IBARAKI (TR) – Ibaraki Prefectural Police have arrested a 55-year-old man over the alleged stabbing of his wife in Mito City on Friday, reports the Sankei Shimbun (Sept. 14). Between around 3:45 p.m. and 4:35 p.m., Shogo Kawakami, of no known occupation, allegedly used a knife to repeatedly stab his wife, 48-year-old Tomoko, in the lower back and other locations of her body. The woman is currently in serious condition, according to the Mito Police Station. After the incident, Kawakami fled the scene in his vehicle. 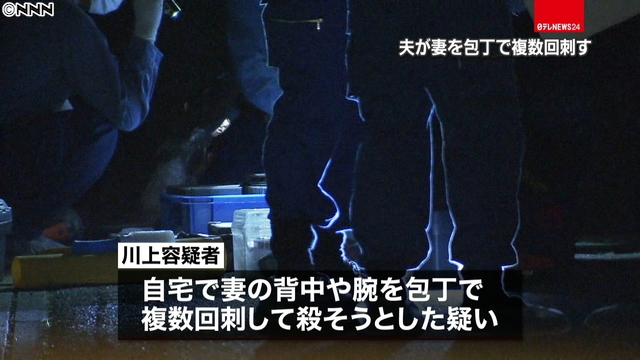 Later that same day, police located the vehicle about 50 kilometers away in Kamisu City. Upon his arrest on suspicion of attempted murder, the suspect admitted to the allegations, police said.